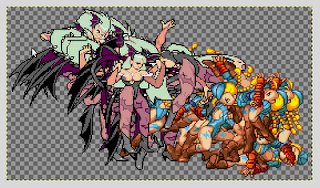 From a previous article: "Street Fighting with Gimp" ; Cammy White (as shadowloo "killer bee") was featured to show Gimp's ability to generate animated Gifs. Conclusion, that wasn't difficult ... just a matter of being patient and consistent in the process. Credit : Sprites used are coming from the "Sprite Database"
Digg has broken an ... axle ? !